Giveaway: Win A LE WEEK-END Blu-ray! UPDATED 7/11: The giveaway has concluded, and the winner has been notified. Thanks to all who entered. 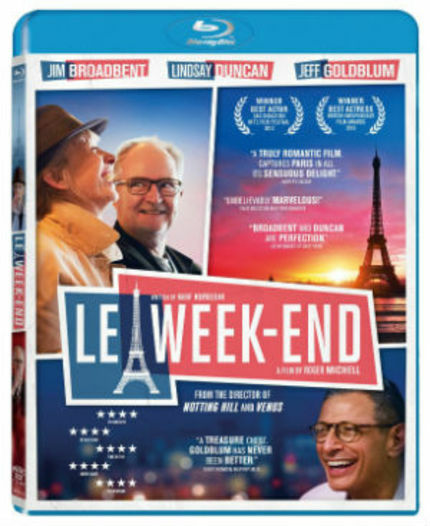 As an antidote to blockbuster season in Hollywood, we have a Blu-ray copy of Le Week-End to give to one reader who is "in the know." Arriving in Paris for the first time since their honeymoon in an attempt to rekindle their 30-year marriage, British college philosophy professor Nick (Jim Broadbent) and schoolteacher Meg (Lindsay Duncan) get off to a rocky start in a cheap and depressing lodge. Moving into a swankier hotel with view of the Eiffel Tower sets them off on a better path, but it doesn't distract them from the knowledge that Nick is being nudged into early retirement, Meg is getting fed up with teaching, and each of them wants a fresh start that may or may not include the other. The diffident, wistful Nick and demanding, take-charge Meg careen from contentment to disharmony to resignation and back again as they take stock of three decades of deep tenderness -- and even deeper regret. A surprise invitation from Nick's old buddy Morgan (Jeff Goldblum), a Paris-based American academic Nick hasn't seen in years, prompts Meg and Nick to take a broader view of their relationship. And it proves to be the catalyst that provides Nick and Meg with an unexpectedly hopeful vision of what their love and marriage might still become. Roger Michell directed from a script by Hanif Kureishi. More information about the film is available at the official site. Now, how can you demonstrate you are "in the know" about the film if you haven't seen it yet? Easy! Just give us the title of a movie directed by Roger Michell that included American and British characters in features roles. (Hint: there's more than one.) Send your answer and mailing address -- U.S. addresses only -- in an email to this address by 11:59 pm, E.S.T., on Thursday, July 10. We will select one winner at random from all correct entries. Entered with delight! I love Jim Broadbent!